In this post, “The Lanny Ross Show”, originally broadcast May 23, 1949 on Mutual and heard here in a version broadcast on the Armed Forces Radio Service as program 90 in the series. The first song on the program is “It’s a Grand Night Night For Singing”. Young vocalist Bobby White sings “The Teddy Bear’s Picnic”. Our show was transferred from an original 16” vinyl Armed Forces Radio transcription. The date is from the disc matrix. Our thanks to blog listener William Harris for his donation of the disc to our collection. Kicking off our posts this week, some highbrow pop concert music. Walter Huston hosts this series produced for Armed Forces Radio and drawing on various sources for the recorded music. The first selection in program 144 is Rubenstein’s “Romance”, performed by an uncredited vocalist and orchestra. William Primrose performs “Jeannie With the Light Brown Hair”. 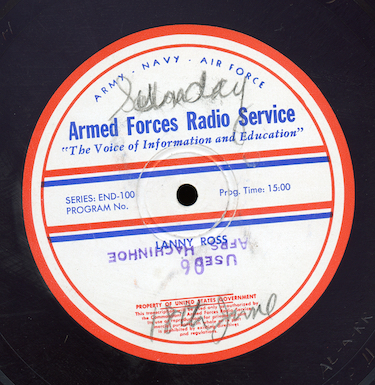 The show was transferred from an original 16” vinyl Armed Forces Radio Service transcription. Our thanks go out to blog listener William Harris for his donation to our collection. 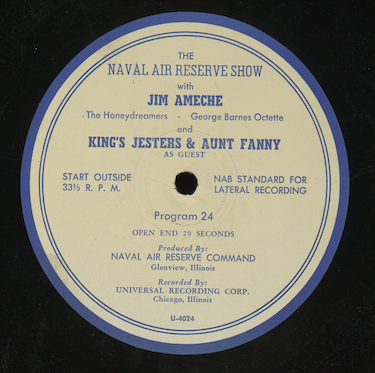 Another quarter hour of upbeat harmony is on the way on the blog with the “Navel Air Reserve Show”, hosted by Don Ameche, with he Honeydreamers with the George Barnes Octette. Program 24 features Sam and Aunt from “The Breakfast Club”. The first song is “Sunday”. Our show was transferred from an original Naval Air Reserve Command 16” vinyl transcription, matrix number U-4024. Thanks again to blog listener William Harris for the disc! 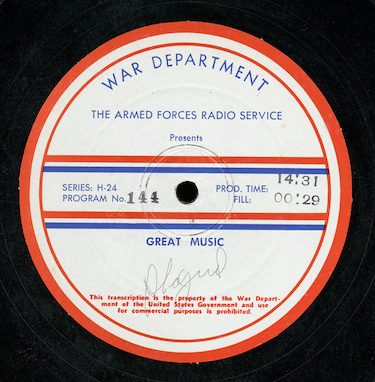 Here’s an obscure Armed Forces Radio Service program, “Great Music”, giving GIs fifteen minutes of short classical works. Program 143 in the series is hosted by Walter Huston. The first selection is the overture to “Ruslan and Lyudmila” by Glinka. Also heard is a two-piano duet by Amparo and José Iturbi. The show was digitized direct from an original 16” Armed Forces Radio Service transcription. Again, my thanks to blog listener William Harris for his donation of the disc to the collection. Next up, a program featuring popular vocalist and “Jack Benny” alumnus Kenny Baker. 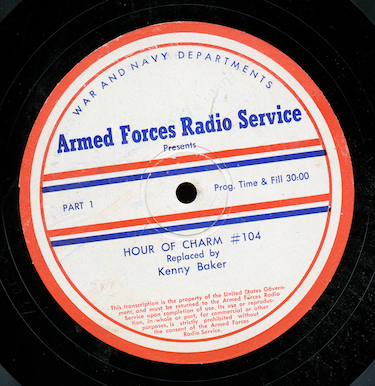 Originally heard September 23, 1945 on CBS, we hear the Armed Forces Radio Network version where it replaced program 104 of “The Hour of Charm”. The guest on the show is harmonica virtuoso Lou Adler. The first song is a medley of “Remember the Night” and “Cheek to Cheek”. Kenny is backed by Robert Armbruster and His Orchestra and Chorus. The announcer is Wendell Niles. 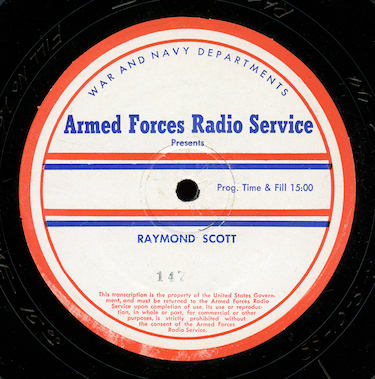 The program was digitized from an original 16” vinyl Armed Forces Radio transcription. The date is from the disc matrix. I believe this is a previously uncirculated episode of the series. My thanks go out to blog listener William Harris for his donation of the disc to the collection! Here’s a rather obscure network musical show “American Rhapsody”. 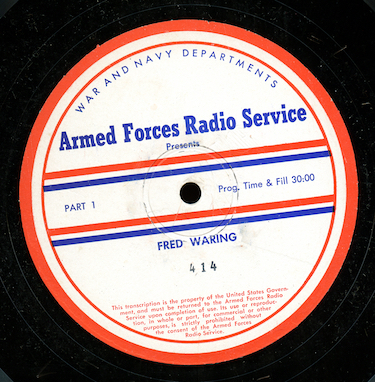 This is the episode of April 7, 1945 as it was heard on the Armed Forces Radio Network replacing Fred Waring program 412. The show, hosted by Frederick Shields, the program features vocalist Gene Baker, the Dix Davis Glee Club, and Wilbur Hatch and His Orchestra (not playing the “I Love Lucy” theme). The first song on the show is “Song of the Vagabonds”. Other songs include “Smoke Gets in Your Eyes” and “The Hills of Home”. We come to the end of our short run of Raymond Scott’s regular fifteen minute program heard on CBS with more arrangements that sound suspiciously like they were modeled after the Glenn Miller band. Dorothy Collins is the featured vocalist and the first number is “Just Close Your Eyes”. 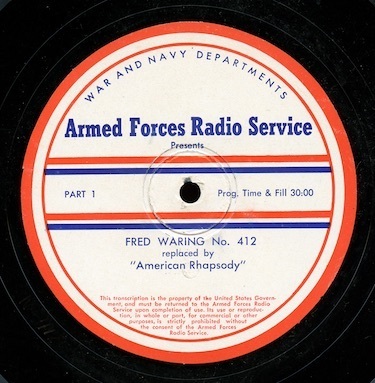 The program was originally heard on October 3, 1944 and the version we’ll hear was distributed to the Armed Forces Radio Network as program 147 in the series. 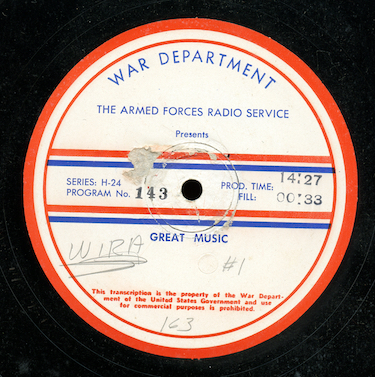 The program was digitized from an original 16” vinyl Armed Forces Radio transcription. The date is from the disc matrix. Again we express our thanks to blog listener William Harris for his donation of the disc to the collection! We’re counting down the last few weeks of this season of blog postings - we have only four weeks left in our posts for this round of posts. Next week, a true rarity - an obscure Western kids adventure show with a female star and the start of an absolutely pristine short run of some World War II propaganda programs written by Norman Corwin. Kicking off the blog this week, some light music from Andre Kostelanez’s popular Sunday afternoon program on CBS. In this post, we hear the broadcast of August 20, 1944, as it was heard on the Armed Forces Radio Network as program 75 in the series. Eleanor Steber and David Ross are heard on the broadcast. This week’s show has songs selected by listeners. The numbers include “Dancing in the Dark” and “Smilin’ Through”. Finally this week on the blog, a popular but less remembered musical variety show. “Major Bowes’s Shower of Stars” was heard on CBS in a series that featured a more traditional format, unlike his famous “Amateur Hour” and its talent competition. 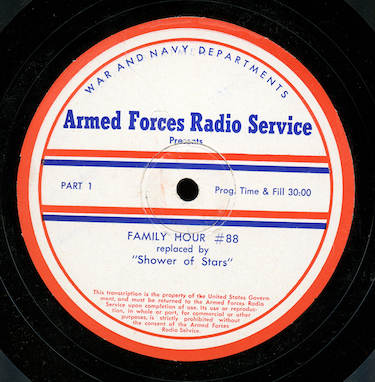 In this post, the broadcast of March 8, 1945, as it was rebroadcast on the Armed Forces Radio Service as a replacement for episode 88 of “The Family Hour”. I think this may be a lost episode of the series. 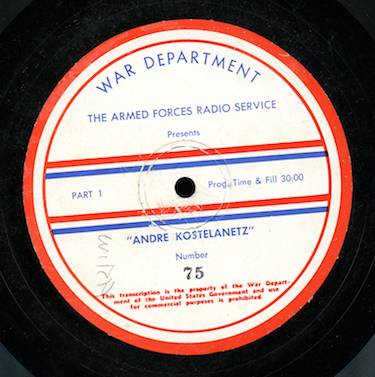 The show was transferred from an original 16” Armed Forces Radio Service vinyl transcription. The date is from the disc matrix.